“To keep every cog and wheel is the first precaution of intelligent tinkering.” Aldo Leopold. I enjoy puzzles. I like the way the full image emerges as I slot each shape into its correct niche. 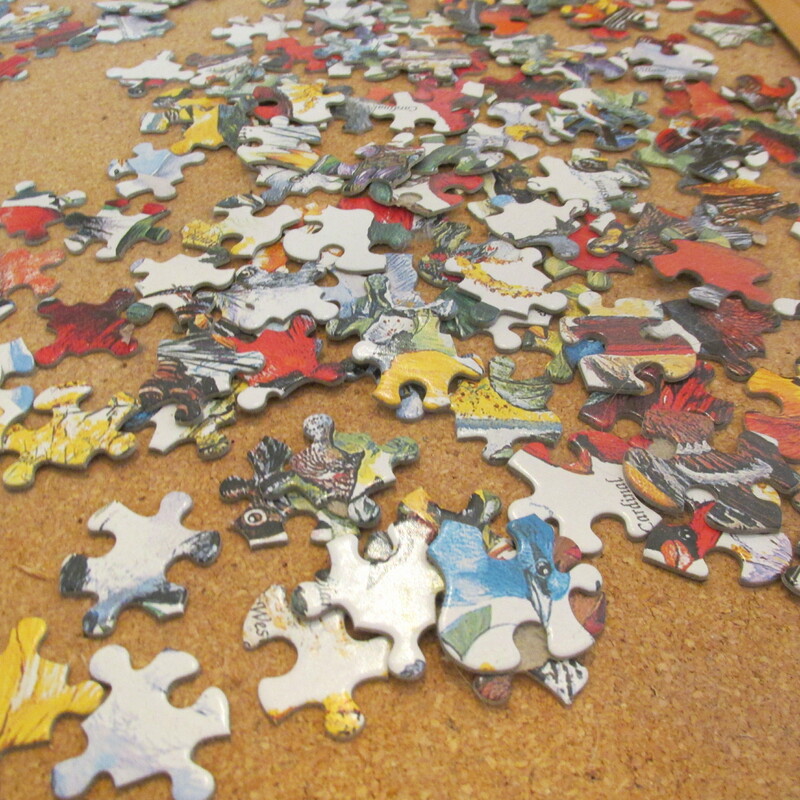 While slowing down and paying attention to the puzzle pieces, I sometimes mentally work through some other knotty problem or issue. However, one of the most frustrating moments in finishing a 1,000 -piece puzzle is realizing you lost a piece along the way. Or several pieces. Sure, you got close. But that one elusive piece keeps the image from what it should be. It nags at you. I think of this as I hike Nachusa Grasslands, a 3,500-plus acre site managed by The Nature Conservancy in Illinois. Nachusa Grasslands is tucked into a patchwork quilt of farms about 90 minutes west of downtown Chicago. Over its 20-plus year history, it has assembled more than 700 native species through restoring habitat. You can see everything at Nachusa from threatened eastern prairie fringed orchids to the uncommon ornate box turtles. 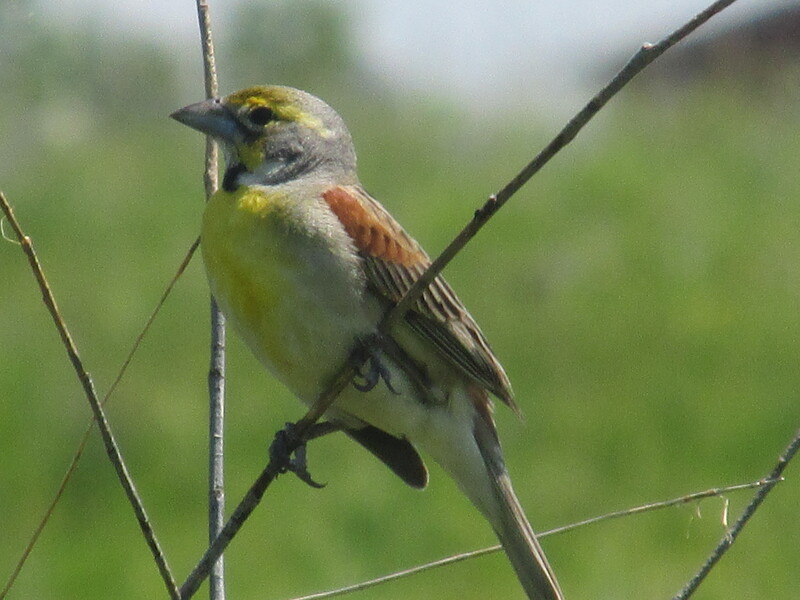 Close your eyes, and listen to the cheerful warble of dickcissels (shown above). In summer, the prairie blooms wash over the landscape in a changing kaleidoscope of purple, gold, pink and white. The grasses – big bluestem, Indian grass, switchgrass, little bluestem — blend together in the fall and early winter in sweeps of breathtaking color. 700 species! That’s enough to complete any prairie, right? A piece of the puzzle was missing here. A big piece. Bison bison. That’s the scientific name. 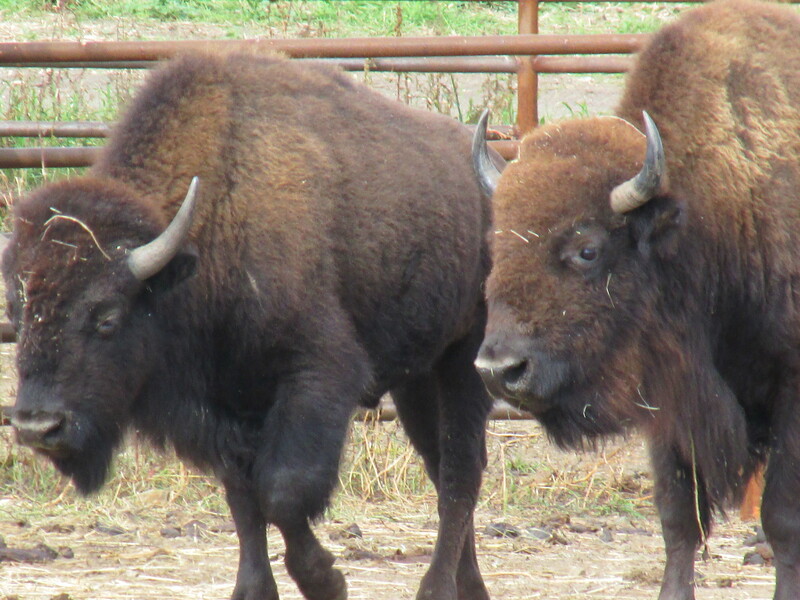 We know them as American buffalo, which disappeared from Illinois about 200 years ago. Now, since late 2014, through the efforts of restorationists and people who weren’t afraid to dream big, they are at Nachusa Grasslands. With the bison puzzle piece in place, other lost “puzzle pieces” — species —may be attracted and restored. A little intelligent tinkering. When I began hiking at Nachusa several years ago and heard about the plan to restore bison, I wondered. Would the preserve suddenly seem like a zoo? Or one of those exotic animal farms you drive by in rural areas with zebras and llamas? A curiosity? 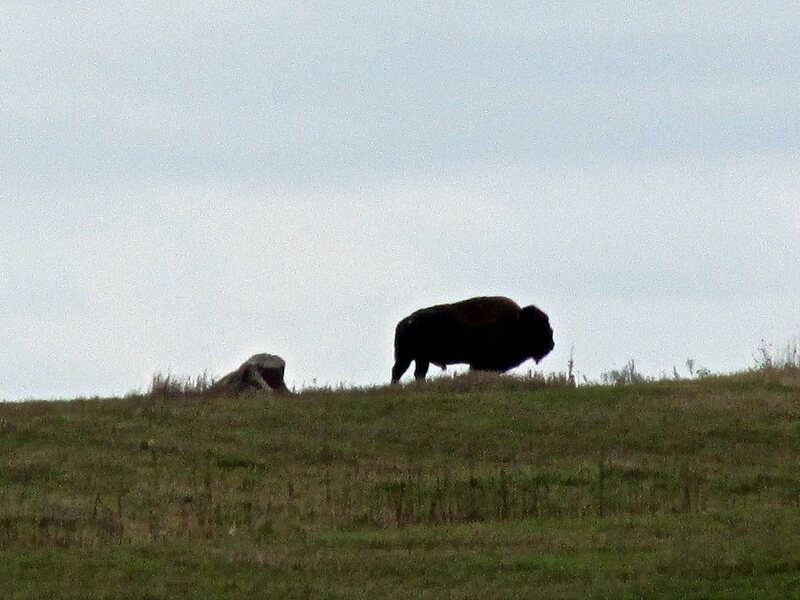 When the bison lumbered out into the tallgrass to graze, my fears were assuaged. They looked like they belonged there. There’s a quietness in the tallgrass; the silence of emptiness. Hike in the tallgrass in the spring, and you’re overwhelmed by the green shoots of new growth and pretty wildflowers. Summer is a riot of colorful blooms; the air full of dragonflies and unusual birds. Fall is all about waves of grasses and fat seedheads. Then comes winter, and January. At first glance, it appears that all life has fled the prairie. 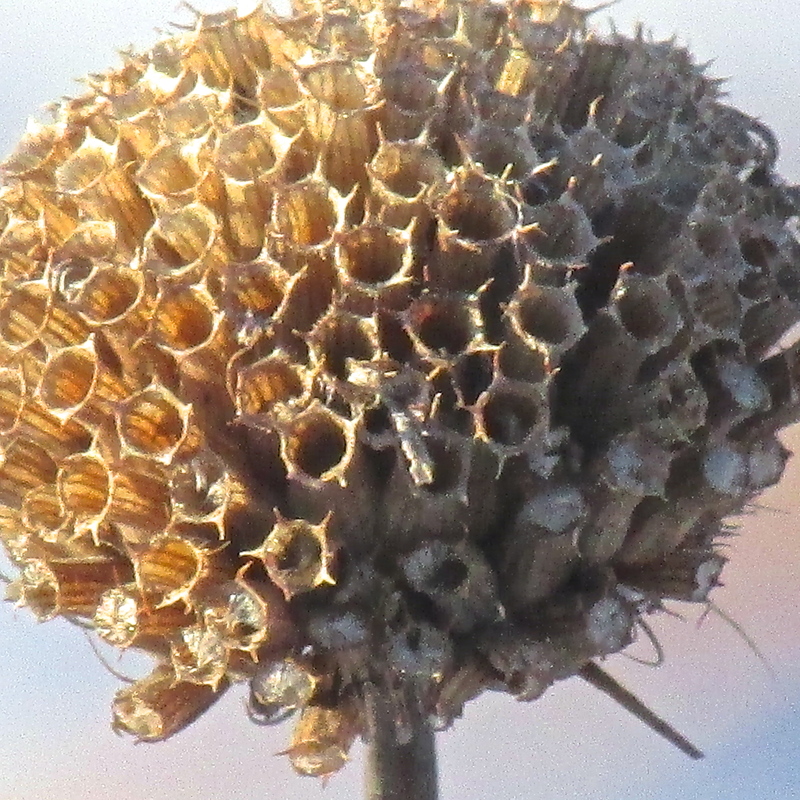 The once-lavender blooms of wild bergamot, or bee balm as gardeners like to call it, are now globes of hollow papery tubes. Each tunnel was once filled with tiny black seed grains that I could shake like pepper into my hands. Now, I try to rattle them and come up empty. Someone has beat me to it. Birds and small prairie creatures, likely, looking for breakfast. Not much here that seems worthwhile on the surface. The tallgrass colors have gradually bleached out with age and cold. No blossoms and nectar remain for bees and butterflies to linger over. Queen Anne’s lace is stripped of everything but the basics. 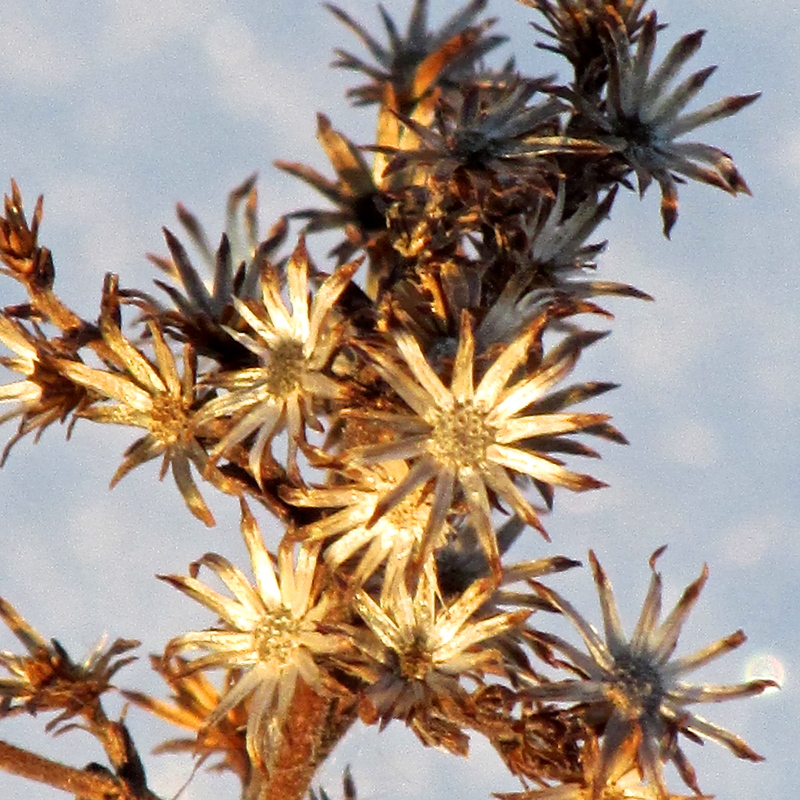 The blown-out stars of the asters take on a different personality in winter. Without the blooms, I’m free to admire the infrastructure. The gift of January is this: the comparative emptiness of the winter season allows us to see the scaffolding upon which the prairie is built. It reminds us that rest is as important as activity; that looking at things over time gives us a different perspective on what we thought we knew well. New ways of seeing open up. If we pay attention. The prairie is pared away to the bare essentials. It rests, quietly, waiting for the emptiness to pass and a new season to come. 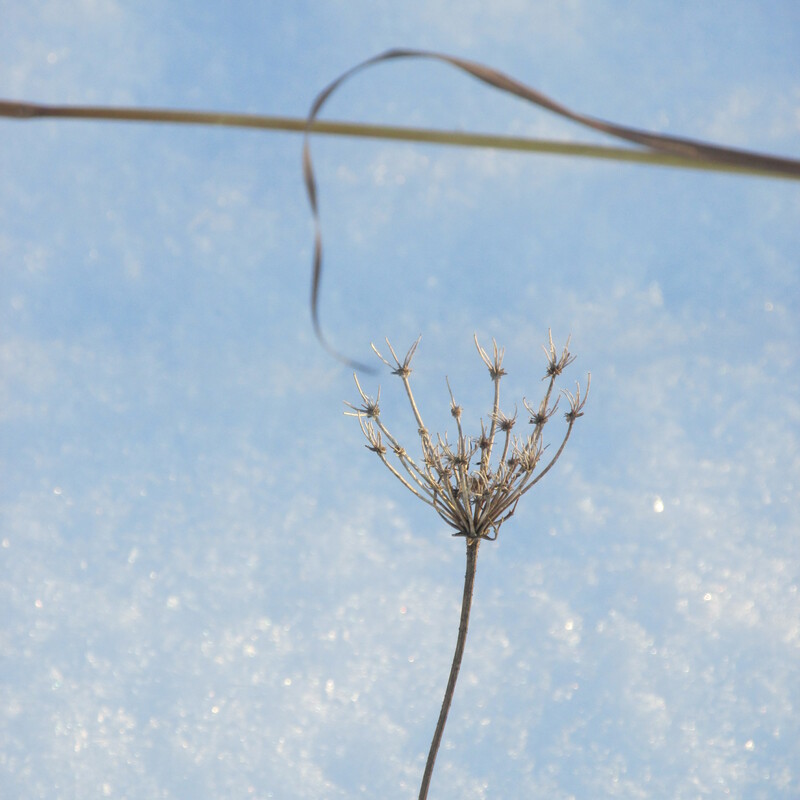 Walking across the prairie in the sub-zero temperatures and snow, you notice surprising things. I know, I know. All the monarchs have long fled — packed their bags and migrated to Mexico. The mourning cloak butterflies are in hibernation, cozied into cracks of tree bark or nestled under fallen limbs. 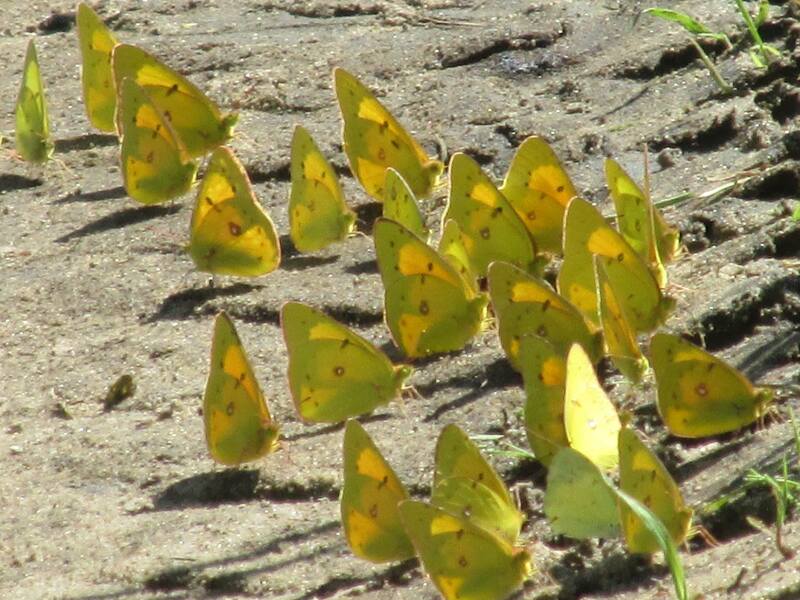 Most of the summer butterflies simply died off when cold weather hit Illinois. Except the ones I see today. When squirrels spring through the snow, the tracks they leave look like a string of butterflies. The sunshine fills their prints with deep indigo shadows. 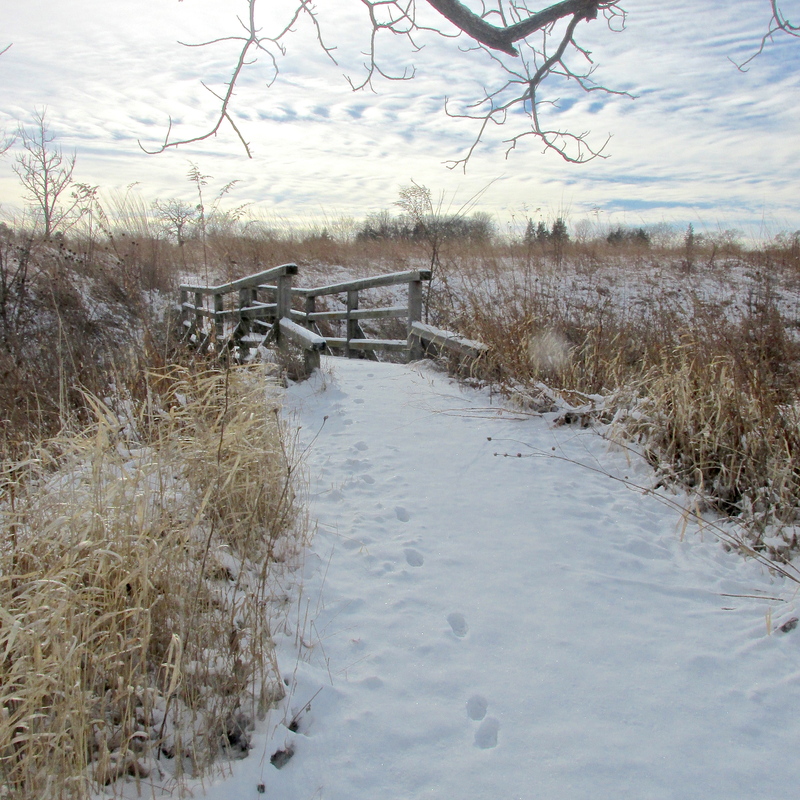 I love hiking the tallgrass, mittens stuffed deep into my pockets, looking for winter butterflies. Most of the squirrels hang out on the edges of the prairie in the savanna, where they nest in leafy oak high-rises. The squirrel print butterflies remind me of summer, and the colorful butterflies to come. But the winter butterflies have their own unexpected beauty as well. All it takes to see them is a little imagination. January 6, 2015 Winter is finally here in full force in the Midwest, with subzero temperatures and a couple of inches of snowfall on the prairie. Terms like Clipper Snow and Polar Vortex are salted into everyone’s conversations, and our shovels are finally getting a workout. 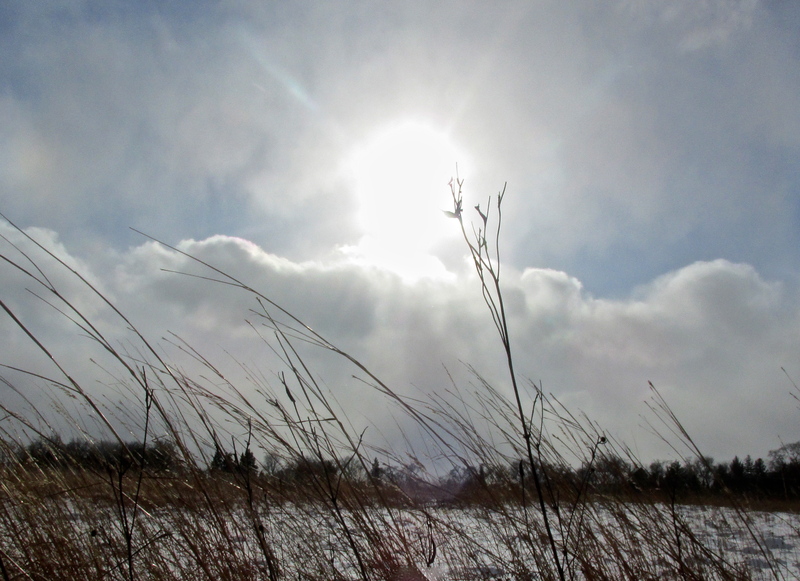 The threatening forecasts, icy roads, and frigid weather ensure time alone on the 100-acre Schulenberg Prairie, just down the road from my house. Everyone else at The Morton Arboretum seems to be parked at the Visitor Center, no doubt drinking hot chocolate and watching nature from more comfortable window seats overlooking Meadow Lake. Despite the urge to join them in the cozy cafe, I continue driving out to the West Side to take a walk in the tallgrass. The sun is bright and there is not a soul in sight. Seemingly, the life of the prairie is on pause. It’s late in the morning; even the birds are silent. The prairie is empty. Or not. The snow cover tells another story. 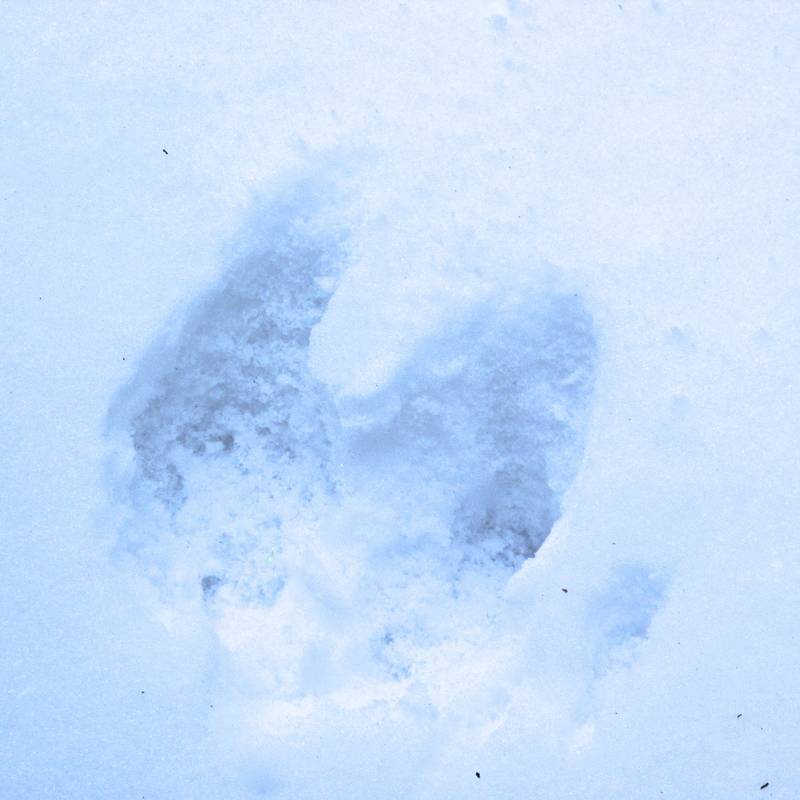 Although mine are the first boot prints to mark the trails, there is ample evidence that several four-footed critters have been up and about. The clover-shaped tracks of a coyote show where it paced the parameters of the prairie and savanna; out for a stroll, perhaps, or more likely looking for something for breakfast. 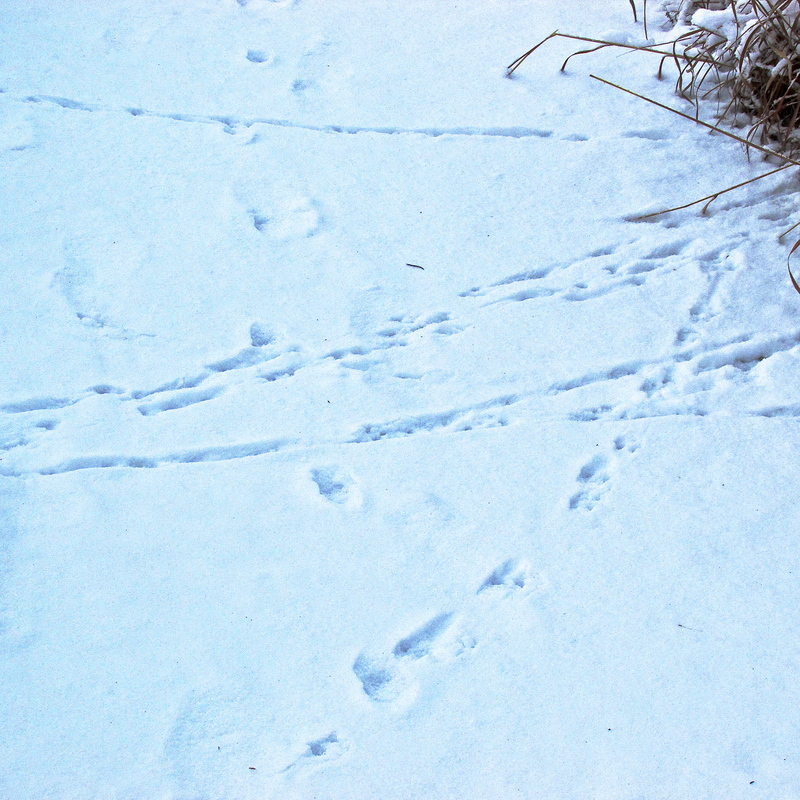 As I hike further in, I see the tunnels of prairie voles crisscrossing the paths; tiny mouse prints stitch pretty patterns from one side of the trail to the other. Those, and a few squirrel tracks, belie the illusion that I have the place to myself. It’s quiet – the grasses, weighted by snow, don’t even rustle in the rising, biting wind. Writer Paul Gruchow called the winter months a time of “sweet peace” on the prairie. He also believed you could tell the temperature by the way the snow sounds under your boots. Does it crunch? It’s probably over 20° F, he said. If it squeaks, you’re likely hiking in zero degree weather. Today is a squeaky snow day. I loop the trails, adding my prints to the tracks of the invisible creatures that have already blazed the trail. At the wooden bridge, I spend a few minutes watching Willoway Brook run clear under the surface ice, in the throes of freezing. 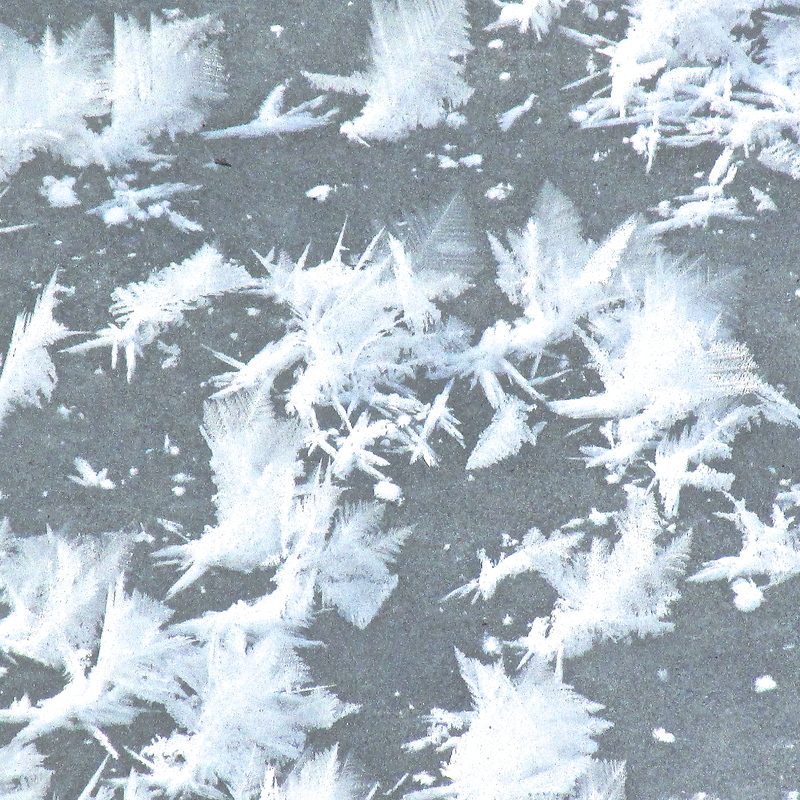 The ice is sprinkled with feathered snow crystals, each so intricate they take my breath away. I watch the water make designs under the ice until realize I no longer feel my fingertips. Time to head back. The life of the prairie and the natural world happens whether we are there to witness it or not. Paying attention just takes a little extra energy, a little discomfort, and a willingness to take time to listen and look. Most of the things in life that matter require the same. 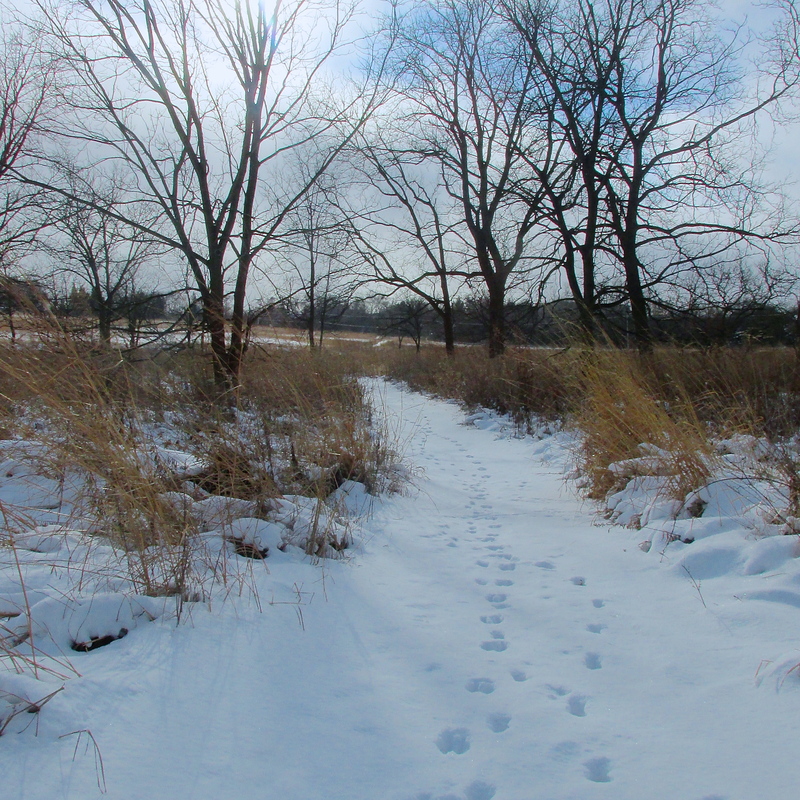 (All photos by Cindy Crosby of the Schulenberg Prairie at The Morton Arboretum).